It's a question many of us have wondered with frequency. 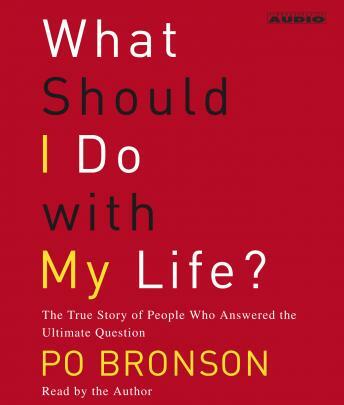 Author Po Bronson was asking himself that very question when he decided to write this book - an inspiring exploration of how people transform their lives and a template for how we can answer this question for ourselves. Po traveled the country in search of individuals who have struggled to find their calling, their true nature. People who made mistakes before getting it right. People of all ages and all professions -- fascinating individuals trying to answer questions such as: Is a career supposed to feel like a destiny? How do I tell the difference between a curiosity and a passion? Should I make money first, to fund my dream? If I have a child, will my frustration over my work go away? Should I accept my lot, make peace with my ambition, and stop stressing out? Why do I feel guilty for thinking about this? This audiobook is like listening in on an intimate conversation among people you care about and admire. There is wisdom and guidance in these stories of people who found meaningful answers by daring to be honest with themselves. With humor, empathy, and insight, Po Bronson probes the depths of people who learned how to hear the whisper, who overcame fear and confusion to find a larger truth about their lives. A meditation, a journey, and a triumph of storytelling, What Should I Do With My Life? is a life-changing audiobook. I enjoyed this cd. The stories were interesting, and the commentary inciteful. There were a few nuggets that made the short cd worth the listen. It was ok. I enjoyed it , but it was not eye opening or something. Now don't get me wrong before I begin, I enjoyed the stories of people and how I share their simularities, but I found it hard to continue listening, because I guess I was looking for something more personal. Not a bad listen, just didn't find that it was helpful to me personally.